Police say Gamponia is described as 5-feet 8-inches tall, weighing 200 pounds with black hair and brown eyes. He was last seen on Jan. 16, 2019 in the Kahakuloa area. 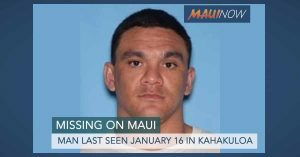 Anyone with information is asked to call the Maui Police Department at (808) 244-6400.